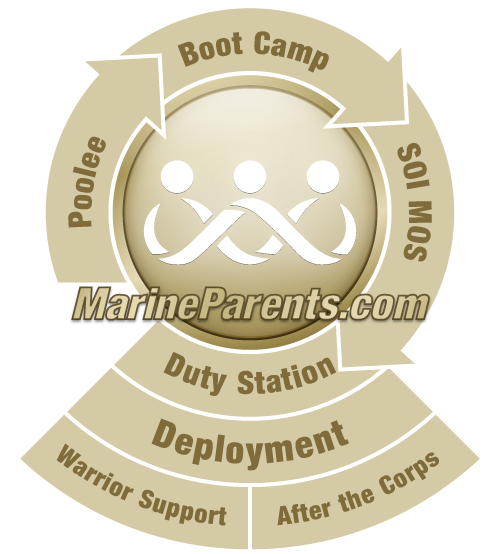 The MarineParents.com websites are provided as a public service by MarineParents.com, Inc, an IRS approved 501(c)(3) public charity. Privacy Act Statement - If you choose to provide us with personal information - like filling out a Contact Us form with e-mail and/or postal addresses - we only use that information to respond to your message or request. We never create individual profiles or give your information to other public or private organizations. MarineParents.com never collects information for commercial marketing. While you must provide an e-mail address or postal address for a response other than those generated automatially in response to questions or comments that you may submit, we recommend that you NOT include any other personal information, especially Social Security numbers. The Social Security Administration offers additional guidance on sharing your Social Security number. For site management, information is collected for statistical purposes. The computer system uses software programs to create summary statistics, which are used for such purposes as assessing what information is of most and least interest, determining technical design specifications, and identifying system performance or problem areas. If you have any questions or comments about the information presented here, please forward them to us using the website's Contact Us page.